Streetsblogger extraordinaire Angie Schmidt is not happy with Uber and Lyft. They’re not really the ones to blame. 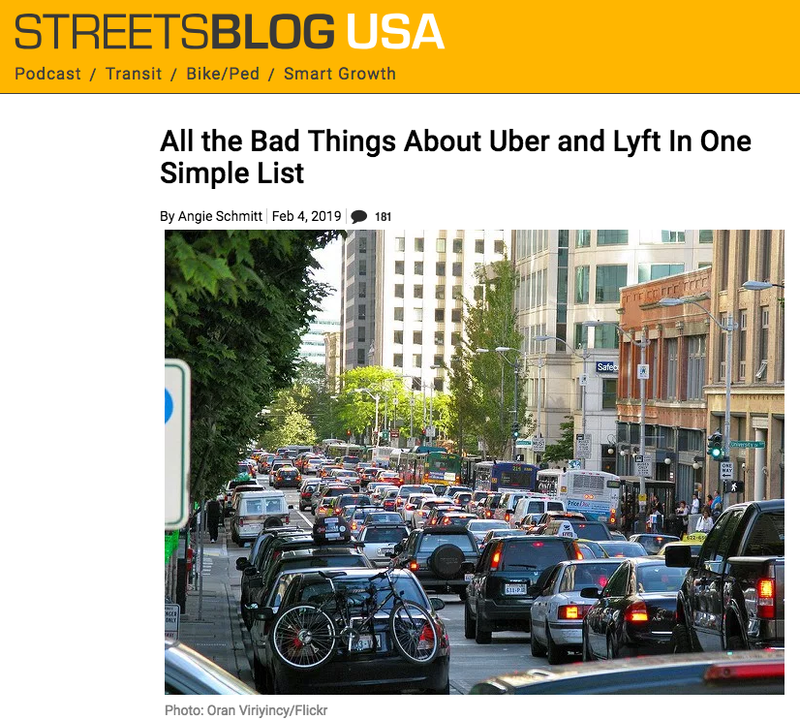 All the bad things about Uber and Lyft in one simple list: More traffic, less transit trips, more traffic deaths greater social stratification: A Comprehensive list’s It’s long. Angie’s list has a pretty damning bill of particulars. She ticks off ride-hailing for increasing driving, dead-heading, operating in transit-served areas, reducing transit use, increasing crashes, reducing cycling and walking, and hoarding data. There’s no question in our minds that too many cars are a big problem for cities, for transportation, for equity, for safety and for the environment. We think it’s important to look deeper at the underlying causes of “too many cars” rather than to focus blame just on ride-hailing. At City Observatory, we’re huge fans of Streetsblog, the nation’s go to sounding board for transportation policy, and regularly count on ace reporter Angie Schmidt to both bring us up to date on what’s happening around the country, as well as offering trenchant observations. It’s rare that we’re in anything but enthusiastic agreement with her posts. This is one of those rare exceptions. Rather than being the cause of our urban transportation problems, ride-hailing services like Uber and Lyft are symptomatic of underlying deep flaws in transportation, the most important of which is that we don’t price road space, particularly at the peak hour and particularly in dense urban environments at anything approaching its value. There’s huge demand to travel in cities, and it has really only been checked by the price of parking and the (historic) numerical limits on for-hire vehicles. As we’ve pointed out at City Observatory, parking prices serve as surrogate road pricing, and discourage people from driving their personal vehicles to downtown areas. Similarly, the limited number (and relatively high price) of taxis under the medallion system meant that taxis weren’t economically or numerically likely to overwhelm city streets. The high cost of parking in city centers is a key reason that people ride transit. When bus fare is lower than parking costs, people tend to ride transit. When parking is free, people drive their private automobiles. There’s always been a huge, unrequited demand for peak hour travel in urban cores. People are willing to pay a premium to travel in these spaces–which is why ride-hailing firms are able to impose surge pricing. What Uber and Lyft have done is evade the two big limits on bringing more cars into central cities. They don’t have to pay for parking, because they don’t park. And they’ve side-stepped the numerical limits on the number of for-hire vehicles allowed, which have been imposed by medallion schemes (although New York has recently capped the number of ride-hailed vehicle). But let’s be clear–the underlying problem is not so much Uber and Lyft per se, it’s the fact that this very valuable, scarce resource–city streets–is un priced. These companies are monetizing and capturing that value for themselves because we don’t charge anyone to use the streets. And of course, our current debate about ride hailed vehicles is just a small scale dress-rehearsal of the challenges we’ll face when autonomous cars become plentiful. Fleets of autonomous cars will overwhelm city streets if those streets aren’t priced. Not having to pay a driver will cut fares more than in half from current levels (to as little as 25 to 40 cents per mile, cheaper than transit fares), and it’s likely that even owners of private cars will find it cheaper to have them slowly circle the block rather than pay for parking. Imposing road pricing (or surcharges) just on ride-hailed vehicles or taxis misses the point that privately owned vehicles cause just as much congestion as ride-hailed ones. Trip taking is similar, and cruising for parking is probably as big a source of “wasted” miles in city centers as is dead-heading or cruising for fares. To be sure, by tapping the latent demand that was held in check by parking prices and taxi limits, the ride-hailed firms have slowed traffic in downtowns like New York and San Francisco. And that has the knock on effect of reducing bus speeds and productivity, which probably explains part of the reason transit ridership is down (as does lower gas prices). While it may be emotionally satisfying to paint Uber and Lyft as the villains here, the real problem is our unwillingness to price streets. In at least one important respect, Uber and Lyft have performed a very important public service: they’ve educated millions of Americans about the marginal cost of automobile travel. Every ride-hailed trip is itemized, and priced by the mile and the minute. And surge pricing begins to show the high value (and cost) associated with travel in peak demand periods (although it allows the companies to capture this economic rent, rather than give it to the public, where it belongs). Moving in that direction is where we’ll find a solution to all of the problems on Angie’s list: The more car use is priced by the mile, and reflects congestion costs, the more efficient our transportation system will be. Although they’ve been far from model corporate citizens in many respects, to their credit, both Uber and Lyft have endorsed road pricing. Rather than simply vilify them and ignore the more fundamental problem, we ought to be working together to fix a flawed system. It would help to do it before autonomous vehicles make this problem an order of magnitude worse than it is now.